When I was young, Nanna Sue and Poppa Bill lived across the road from us. They were like our grandparents, though not related by blood, as is often the case with special people in our lives. I remember their garage door painted red, white and black, a constant reminder of their beloved Saints. I remember Joey the blackbird and all his family that lived in a tree next to their window for generations. 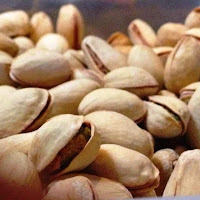 I remember pistachios, Nanna Sue sitting at the kitchen bench, cracking open the shells and nibbling the yummy little nuts hidden inside. I'm not sure whether it was the nuts themselves, or rather the saltiness or the ritual of shelling them that I enjoyed the most, but when I think of pistachios I think of Nanna Sue. During my teens and twenties I seemed to have forgotten these little gems, but rediscovered them in my thirties and haven't looked back. Little did I know they are super full of goodness and the shells are great in compost. According to the Pistachio Health Institute (yep, who knew??? ), there's even a World Pistachio Day! Must pop February 26th in my diary. Here are some other things you probably didn't know about pistachios. Do you like pistachios? Raw or salted? In recipes? I'd love to hear. I've just read a little article about nuts and found the bit about pistachios to be most interesting. Check it out here.